Cesare Borgia (September 13, 1475 – March 11, 1507) was a Spanish-Italian cardinal who resigned his church office to became a military commander, powerful lord, and a leading figure in the politics of his era. The acknowledged but illegitimate son of Pope Alexander VI, Borgia was the sibling of Lucrezia, Jofré, and Giovanni Borgia. Borgia was a brilliant general who lived during the period when the papacy was a both a spiritual and military power. Cesare Borgia's actions greatly advanced the domain of the Papal States after his father became pope. Simultaneously Borgia became a powerful political figure in his own right. His amassed titles included Duke of Valentinois and Romagna; Prince of Andria and Venafro; Count of Dyois; Lord of Piombino, Camerino, and Urbino; Gonfalonier; and military Captain-General of the Holy Church. Borgia gained a reputation not only for effectiveness as a military leader but for outright ruthlessness in the pursuit and maintenance of power. Many believe he was the model for Niccolo Machiavelli's vision of The Prince. His character has been portrayed in literature and film. 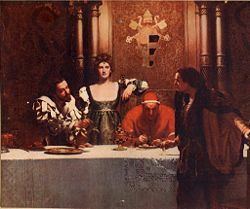 Cesare Borgia and his family came to represent the height of the Renaissance papacy's corruption and ambition a generation before Protestant Reformation. In many ways the excesses of Borgia's support of the papacy proved to be the impetus for the Reformation. With brown eyes and orange hair, Cesare was acknowledged to be a beautiful child and grew to be a fleet-footed, tall, handsome man of great ambition, much like his father. He was initially groomed for a career in the church and was made bishop of Pamplona at the age of 15. Three years later, after legal studies in Perugia and Pisa and his father's election as Pope Alexander VI in 1492, Cesare was made cardinal and became Alexander's close adviser. Cesare's religious vocation was never strong, and he gained a reputation at the papal court for his womanizing, lavish clothing, and hunting parties. Alexander VI staked his primary hopes for the Borgia family on Cesare's younger brother Giovanni, who was made duke of Gandía in eastern Spain and captain general of the military forces of the papacy, in which capacity he led campaigns in 1496, against factions of the nobility who had rebelled against Alexander's rule, especially the Orsini family. However, Giovanni was assassinated in 1497, under mysterious circumstances, and several contemporaries suggested that Cesare was his killer. With a military career now open to him and his father in need of a trusted captain, on August 17, 1498, Cesare became the first person ever to resign as cardinal. Meanwhile, a key political marriage had been arranged between Cesare and Charlotte d’Albret, sister of King John III of Navarre in northern Spain. King Louis XII of France immediately named Cesare duke of Valentinois (southeastern France), securing his future nickname, "Valentino." Map showing position of Emilia-Romagna today. Cesare's alliance with France, reinforced during the course of the Italian Wars, helped lay the foundation for his military political career, as did his father's ability to distribute patronage in ways that favored Cesare. 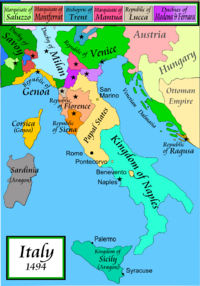 Cesare's French marriage also secured the assistance of France in Alexander's plan not only to regain control in the rebellious areas of the Papal States but also to create a permanent political domain for the house of Borgia. Cesare's first important victory came in support of Louis XII who had invaded Italy, in 1499, in an effort to press his claims against those of Ferdinand I of Spain regarding the kingdoms of Milan in the north and Naples to the south of Rome. As captain general of the papal army, Cesare accompanied Louis in his victorious entrance into Milan. Alexander now moved toward the creation of a Borgia domain in northern Italy. The pope deposed his vicars in the provinces of Romagna and Marche, and Cesare—with a number of Italian soldiers supported by 300 cavalry and 4,000 Swiss infantry provided by Louis XII—marched on Imola and Forlì in Romagna. These towns were ruled by Caterina Sforza, the mother of the Medici military leader Giovanni dalle Bande Nere. After the conquest of Imola and Forlì, Cesare's French troops were withdrawn from him, but he returned to Rome to celebrate his triumph and received the prestigious title of papal Gonfaloniere (papal protector) from his father. In 1500, gifts to the pope associated with the creation of 12 new cardinals gave Alexander enough money to hire the forces of the powerful condottieri (mercenary leaders) Vitellozzo Vitelli, Gian Paolo Baglioni, Giulio and Paolo Orsini, and Oliverotto da Fermo. Under Cesare's command, these forces served to renew the campaign to expand the Papal States in Romagna. Cesare's forces went from victory to victory. Giovanni Sforza, the former husband of Cesare's sister Lucrezia, was soon ousted from Pesaro. Pandolfo Malatesta lost Rimini. Faenza, too, surrendered, its young lord Astorre III Manfredi later being drowned in the Tiber river by Cesare's order. 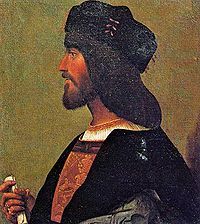 In May 1501, Cesare was created duke of Romagna. 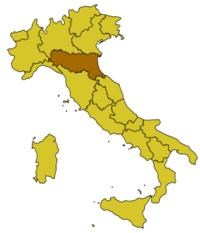 Cesare now moved to add the lordship of the western seaport town of Piombino in Tuscany to his new lands. While his condottieri managed the siege of Piombino, Cesare commanded the French troops in the sieges of Naples and Capua south of the Papal States. On June 24, 1501, his troops successfully stormed Capua, causing the fall of the Spanish power in southern Italy. In June 1502, he set out for the region of Marche on Italy's east coast, southeast of Romagna, where he was able to capture the towns of Urbino and Camerino without a fight. It was at this time that Niccolo Machiavelli, as an ambassador of Florence embedded with Cesare’s forces, came to so admire the Borgia prince's ruthlessly competent character and behavior. Cesare's next step would be Bologna, the key city of Romagna. However, several of his condottieri, who feared Cesare's unbridled power, now set up a plot against him. His commanders Guidobaldo da Montefeltro and Giovanni Maria da Varano returned to Urbino and Camerino and Fossombrone and led a coalition of forces in revolt. Cesare, with inadequate troops, fought a successful defensive campaign against them until funds from the pope enabled him to rebuild his forces and work through diplomatic maneuvers to split the coalition aligned against him. He then called for a truce and negotiations, but treacherously imprisoned the remaining conspirators in the port city of Senigallia and had them executed for treason. Cesare Borgia, Palazzo Venetia, Rome. The news of his father's death in 1503 arrived when Cesare, himself gravely ill, possibly of the same disease (thought to be malaria), was planning the conquest of Tuscany. Despite being at the height of his power, Cesare could do nothing without continued papal patronage. 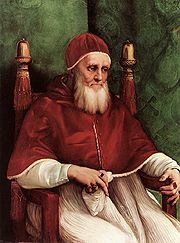 While he was convalescent in Castel Sant'Angelo in Rome, he was able to create enough influence on the conclave to elect a new pope he believed would support him in Pius III. However, this pope's reign was shockingly short, lasting less than a month. After the new pope's death, Cesare seems to have been deceived into giving his support to the new likely candidate, Julius II, who in fact had never ceased being an enemy of the Borgias. Vacating Rome and moving to Romagna to quench a revolt, Cesare was seized and imprisoned by his own former ally, Gian Paolo Baglioni, near Perugia. All his lands were forfeited to the Papal States. Exiled to Spain in 1504, he escaped from a Spanish prison two years later and joined his French brother-in-law, King John III of Navarre. In his service, Cesare died at the siege of the Spanish town of Viana in 1507, at the age of 31. Cesare and his wife Charlotte d'Albret were parents to a daughter, Louise Borgia, (1500-1553) who married first Louis II de La Tremouille, Governor of Burgundy, and secondly Philippe de Bourbon, Seigneur de Busset. Cesare was also father to at least 11 illegitimate children, some of whom became well known. Rumors that he fathered a daughter through an incestuous relationship with his sister are considered unfounded. Not so holy family: Cesare Borgia (left) with father Rodrigo (Pope Alexander VI) and sister Lucrezia. Cesare Borgia has been the subject of many legends regarding his ruthlessness and cruelty. He and his father, Pope Alexander VI, are considered by many to be the epitome of power-hungry corruption surrounding the Renaissance papacy. His family became the brunt of sermons by the likes of puritanical preachers such as Savanorola, as well as vicious propaganda by various political rivals. He has been featured prominently, nearly always portrayed as a villain, in numerous motion pictures and modern or contemporary novels. 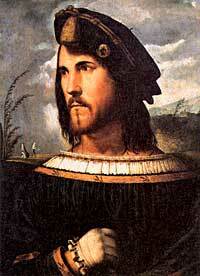 However, Cesare was also a brilliant military commander and a skillful statesman. He was greatly admired by Niccolò Machiavelli, who was at Borgia's court from October 7, 1502 through January 18, 1503. During this time Machiavelli wrote regular dispatches to his superiors in Florence, many of which have survived and are published in Machiavelli's collected works. Machiavelli also used many of Borgia's exploits and tactics as examples in The Prince and advised politicians to imitate Cesare. Two episodes were particularly impressive to Machiavelli: The method by which Borgia pacified the Romagna, and his tactics leading up to the execution of his rebellious captains in Senigallia. However, Machiavelli's praise for Borgia as the ideal of a prince unconstrained by moral conscience is subject to a great deal of controversy. Some scholars see in Machiavelli's Borgia the precursor of a parade of moral outrages carried out by various rulers, culminating in the heinous state crimes in the twentieth century. A man of scientific rather than artistic interests, Cesare Borgia briefly employed Leonardo da Vinci as military architect and engineer. A little known fact about Cesare Borgia is that, according to the French writer Alexandre Dumas and others, his handsome appearance seems to have influenced many images of Jesus Christ painted during and subsequent to his career. Bradford, Sarah. Cesare Borgia, His Life and Times. New York: Macmillan, 1976. ISBN 978-0025144002. Haney, John. Cesare Borgia. New York: Chelsea House, 1987. ISBN 978-0877545958. Johnson, Marion. The Borgias. New York: Holt, Rinehart & Winston, 1981. ISBN 978-0030595769. Puzo, Mario, and Carol Gino. The Family: A Novel. New York: Regan Books, 2001. ISBN 978-0060394455. This page was last modified on 24 January 2017, at 17:10.